There are several ways to get Lithium-Ion State of Charge (SoC) measurement or Depth of Discharge (DoD) for a lithium battery. 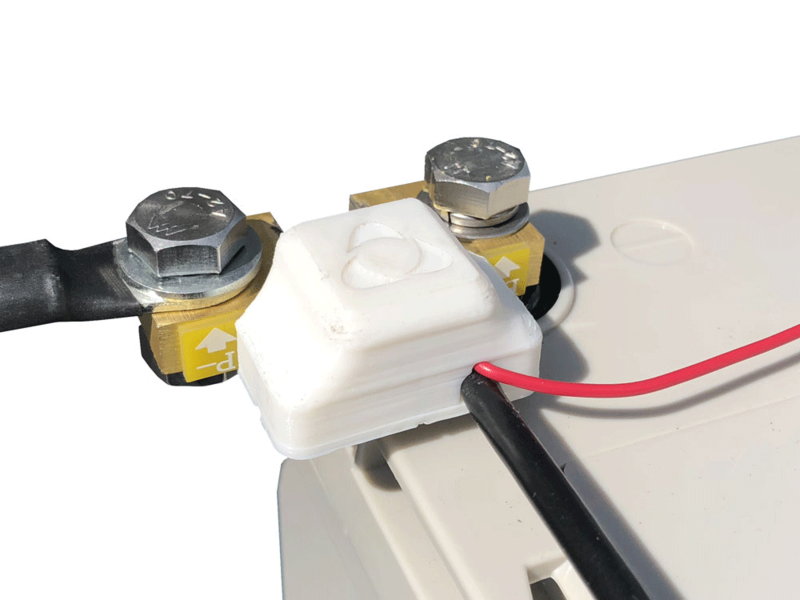 Some methods are quite complicated to implement and require complex equipment (impedance spectroscopy or hydrometer gauge for lead acid batteries). 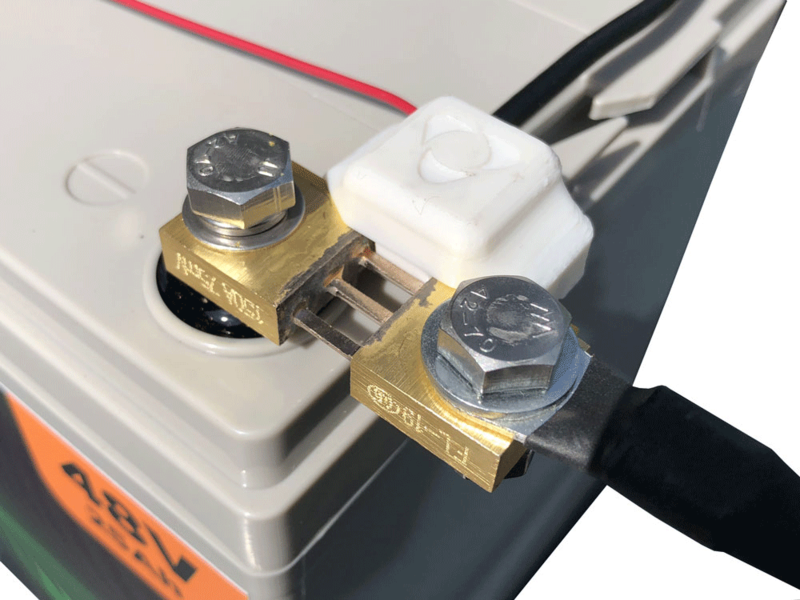 We will detail here the two most common and simplest methods to estimate the state of charge of a battery : voltage method or Open Circuit Voltage (OCV) and coulomb counting method. All types of batteries have one thing in common: the voltage at their terminals decreases or increases depending on their charge level. 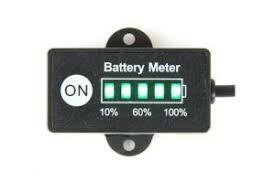 The voltage will be highest when the battery is fully charged and lowest when it is empty. This relationship between voltage and SOC depends directly on the battery technology used. 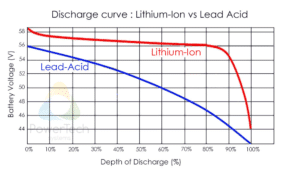 As an example, the diagram below compares the discharge curves between a lead battery and a Lithium-Ion battery. It can be seen that lead-acid batteries have a relatively linear curve, which allows a good estimation of the state of charge : for a measured voltage, it is possible to estimate fairly precisely the value of the associated SoC. However, Lithium-ion batteries have a much flatter discharge curve, which means that over a wide operating range, the voltage at the battery terminals changes very slightly. 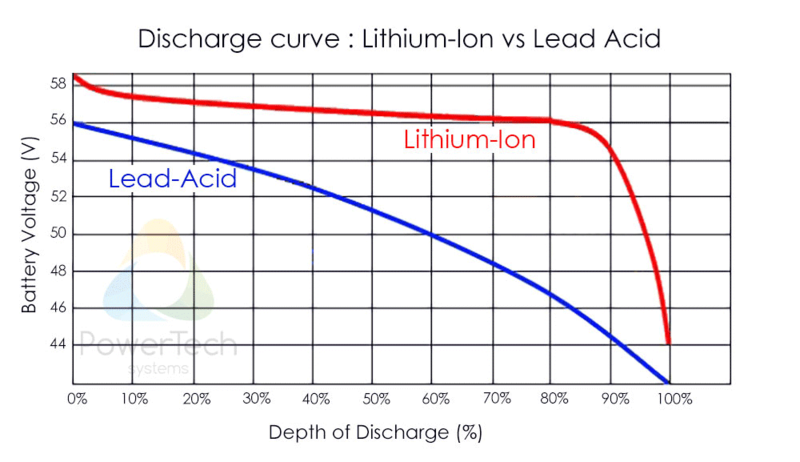 Lithium Iron Phosphate technology has the flattest discharge curve, which makes it very difficult to estimate SoC on a simple voltage measurement. Indeed, the voltage difference between two SoC values may be so small that it is not possible to estimate the state of charge with good precision. 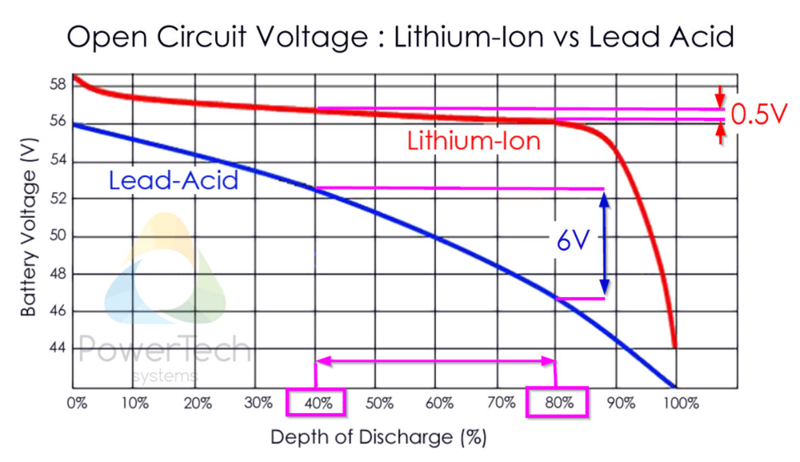 The diagram below shows that the voltage measurement difference between a DoD value of 40% and 80% is 6V for lead-acid technology, while it is only 0.5V for lithium-iron phosphate ! 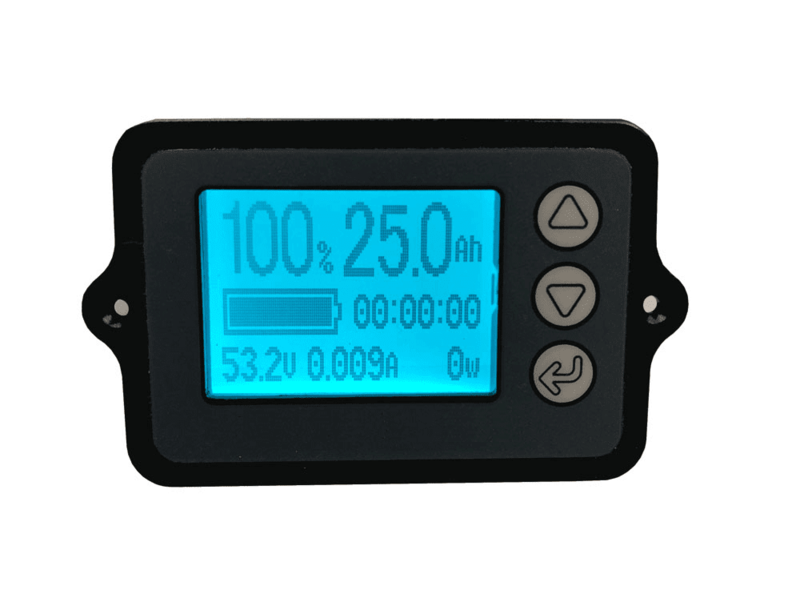 However, calibrated charge indicators can be used specifically for lithium-ion batteries in general and lithium iron phosphate batteries in particular. A precise measurement, coupled with a modelled load curve, allows SoC measurements to be obtained with an accuracy of 10 to 15%. To track the state of charge when using the battery, the most intuitive method is to follow the current by integrating it during cell use. 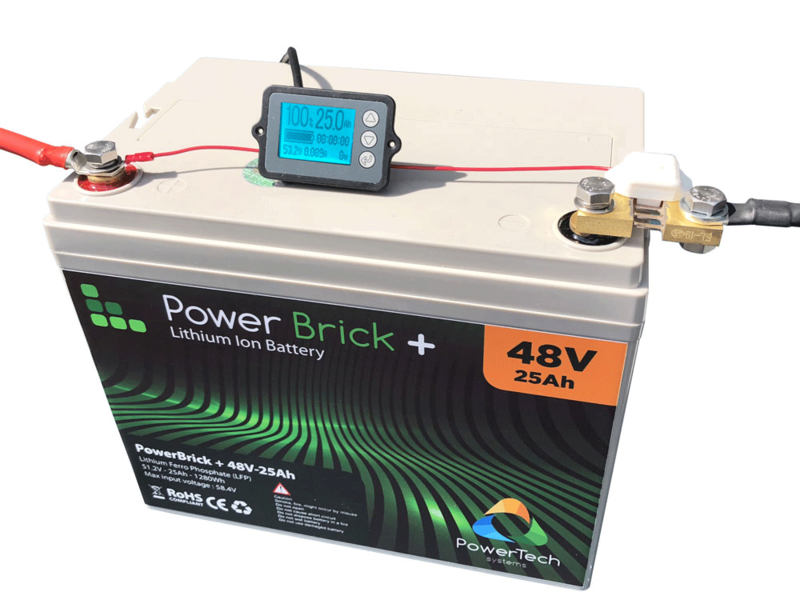 This integration directly gives the quantity of electrical charges injected or withdrawn from the battery, thus making it possible to precisely quantify the SoC of the battery. Unlike the OCV method, this method is able to determine the evolution of the state of charge during battery use. It does not require the battery to be at rest to perform an accurate measurement. Although current measurement is performed by a precision resistor, small measurement errors may occur, related to the sampling frequency. 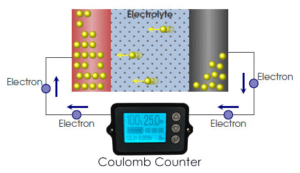 To correct these marginal errors, the coulomb counter is recalibrated at each load cycle. Lithium-Ion State of Charge (SoC) measurement made by coulomb counting allow a measurement error of less than 1%, which allows a very accurate indication of the energy remaining in the battery. Unlike the OCV method, coulomb counting is independent of battery power fluctuations (which cause battery voltage drops), and accuracy remains constant regardless of battery usage.